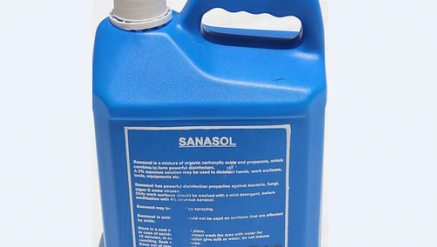 Sanasol disinfectant is a mixture of organic carboxylic acids and propanols which combine to form powerful disinfectants. A 3% aqueous solution may be used to disinfect hands , work surfaces, tools , equipments etc. Sanasol has powerful disinfection properties against bacteria, algae, fungi and some viruses.